How can art history be made engaging and relevant to students coming at the topic from diverse disciplines and backgrounds? 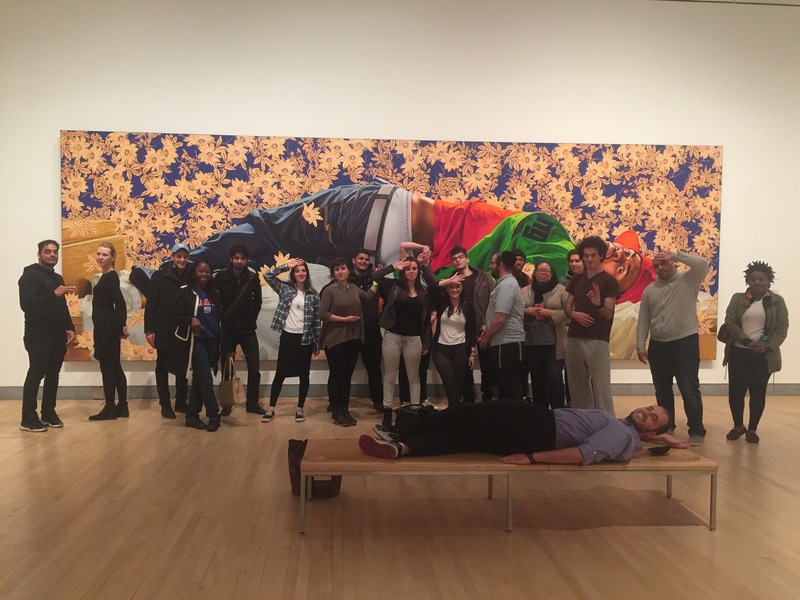 How can students gain agency in the process of studying historic art and architecture? 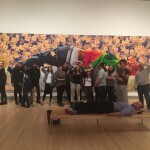 To what extent can an art history survey be participatory and student-driven? I frequently grappled with these questions while working as a teaching fellow at Brooklyn College, where the introduction to art history survey is a required course that students often enter with dread, fearing boring lectures and tedious memorization. These questions led me to apply to be part of the pilot course of the Futures Initiative, a CUNY-wide initiative dedicated to “advancing innovation and equity in higher education.” “Mapping the Futures of Higher Education,” team-taught by Futures Initiative Director Cathy Davidson and Graduate Center President Emeritus William Kelly, brought together a group of twelve Graduate Center students teaching in diverse disciplines across the CUNY system. The course sought to create a network of teachers and students, all of whom were discussing and testing pedagogical approaches that are frequently described as “peer-to-peer” or “student-centered” because they position the student as an active participant in knowledge creation and exchange, rather than a passive recipient. Although led by two experts in higher education, Mapping the Futures of Higher Education exemplified student-centered pedagogy: on the first day Cathy and Bill left the classroom so that us students could determine the four themes that would shape the syllabus. After some debate, we established the central themes for the course–Assessment, Student-Centered Pedagogy, Professors and Persistence, and Embodiment and (Meta)movement–and formed groups that would collaboratively teach these themes. For each section, we presented research and modeled strategies, implemented a selection of the strategies in our undergraduate classes, and then discussed them, both in class and through a unifying digital platform. Check out our syllabus and class overviews here. The aim of this post is to share some of the most successful aspects of my experiments with the Art History Teaching Resources Community. Most are easy to implement and incorporate, simple activities that can begin to alter students’ stake in the learning process. Student Demographics: The facilitators of the Professors and Persistence unit presented an overview of CUNY demographics. Statistics like “47% of CUNY undergraduates come from a household with less than $25K annual household income,” “78% of CUNY undergraduates work to pay living expenses,” and “88% live with family” provide tremendous insight into the struggles faced by many of my students to financially support their own education and find time to study. This knowledge helped me to shape attendance and office hour policies — for example, I included online office hours, in addition to onsite hours — and better-informed my understanding of my students. Think-Pair-Share: This is a beloved teaching strategy that I was not aware of before taking this class. Think-Pair-Share is a timed exercise where students are asked to respond to a prompt first individually, in writing, and then to discuss their response with the person sitting next to them, and, finally, to share what they discussed with the class. The trick is that each of these actions must occur in a condensed time period, typically 90 seconds. This activity is a great way to review material, process an argument or a reading, or form analysis. It can also invigorate a lagging class and smooth transitions between activities. Conversational Moves: Conversational Moves is a dialogue-facilitation game that can be played during class discussions. Each student has to draw an instruction at random and then follow that instruction during the discussion. For example, one student might receive the instruction to “Disagree with someone in a respectful and constructive way.” The “moves” both engage students in group conversation and model a variety of ways that they can participate. Group Roles: This strategy is inspired by Larry Michaelsen’s Team-Based Learning approach, which places students in groups and assigns each group member a specific role such as researcher, group manager, recorder, reporter. I often used group roles as a tool for the discussion of readings: I would break my students into groups, ask them to assign roles within the groups, and then give them a few questions to work through. The researcher could use any available text or technology to look up information, the manager had to watch the clock and keep the group on task, the recorder recorded their responses, and the reporter reported the responses to the class. Before using group roles I thought the strategy would seem childish to my students, but they responded well to it and it made group work more balanced and directed. During the Assessment unit of the Mapping the Futures course we discussed the difference between formative assessment–which provides ongoing feedback, helping students and allowing professors to adjust teaching according to student needs–and summative assessment–which evaluates completed student performance. I brought several models of the former into my class. Student Surveys: I always give my students an introductory survey to get a sense of who they are and why they are taking the class, but after our class discussion about assessment, I decided to give them a pre-midterm survey, in addition. Here is the survey that I used. This pre-midterm survey encouraged them to assess their own work in the class and allowed them to have input into the format of the midterm. Exit Passes: A very low-stakes form of formative assessment, exit passes require students to answer a quick prompt on an index card and hand in their card to the instructor as a “pass” to leave the classroom. Their answers can then help to guide the lesson for the following class. Student-Created Rubrics: Although I did not have time to try this in my Brooklyn College class, it is something I plan to do in the future. Rather than handing students a rubric for an assignment or exam, I will ask them to work together to design their own. By designing rubrics, students gain insight into the grading process and agency in how their work will be marked. Student-Generated Quizzes: Students can write quizzes for eachother, following guidelines set by the instructor, or students can each contribute a quiz question and the instructor can create the quiz out of a selection of these questions. This serves as both a review mechanism and a way to dehierarchize the exam structure. Student-Centered Exam Reviews: Before the midterm and final exam, I divided my students into groups, assigned each group a key work, and asked them to create a review guide for the work. Before beginning this process, I asked my students to generate a list of points/concepts that they would want this review guide to cover (ie. key points of visual analysis, context, connected readings, works that their work could be compared to, etc.) The groups then had 40 minutes to draft their review guide followed by 5 minutes to present the work to the class. They also asked for feedback or questions that they then incorporated into the guide. I posted the guides to the course website so that everyone could access them while studying. 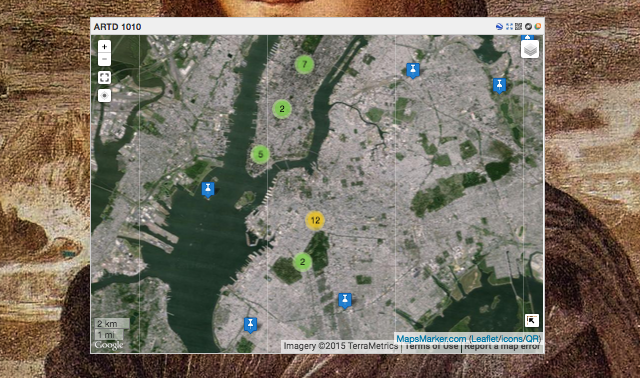 Collaborative Digital Projects: The culminating project for all of the Mapping the Futures of Higher Education undergraduate courses was a collaborative class map (created using Mapsmarker Pro on our course WordPress) My classes’ map aggregated the sites and artworks around NYC that my students were writing about and researching for course assignments. Throughout the term, they added map markers, images, excerpts, and links, creating their own guide to the art and architecture of the city. This was a powerful project in that it enabled my students to create their own art history, not just through individual papers, but through a collectively-generated resource. There are many other platforms that would work well for this type of collaborative digital project, such as Tiki-Toki, and Prezi. A Student-Centered Syllabus: At the end of the semester, I created this syllabus to think through ways that an intro to art history survey course at Brooklyn College could be more fully student-centered. Cathy Davidson, “How Do I Get Started? A Step-by-Step Guide to Designing a Student-Centered Classroom, Pt 1,” www.hastac.org, August 4, 2015. Thanks for sharing your findings. I used to teach college American Studies courses using peer-teaching techniques, and I’m happy to see how far the approach has advanced. I’ve now switched from writing print books on art history to text-and-images designed specifically for the iPad because I believe the digital format offers a more engaged, participatory, accessible (and inexpensive) way to educate readers.